Cut the carrot, cucumber and beetroot into thin ‘matchsticks’. If your knife skills are somewhat questionable; use a peeler or mandolin to slice the veggies thinly, then stack the slices together and slice vertically through them to make the sticks. Or, if your knife-skills are not very good at all, buy them pre-sliced. Cut the seaweed into thin strips and pick the basil and mint leaves off the stalks. Arrange all your filling items neatly on a chopping board so that you don’t miss any of them out when you put the rolls together. Fill a large bowl with warm water. Soak the rice paper sheets in the water until they are soft. Place a clean, damp cloth on your chopping board and place the wet wrapper on it. Smooth it out so that it is completely flat. Place your ingredients just above the middle of the wrapper in a straight line. Be careful not to put too much in as it will make it difficult to roll. Fold the top of the wrapper all the way over your fillings (about 1/3rd of the way down) and press them tightly, being careful not to break the skin*. Fold over the two sides inwards before rolling it to the bottom. Keep under a damp cloth until use. Make your sauce: Combine the peanut butter and vinegar in a small bowl. Grate the ginger through a fine grater into the mixture and add coconut milk until it reaches the desired consistency. 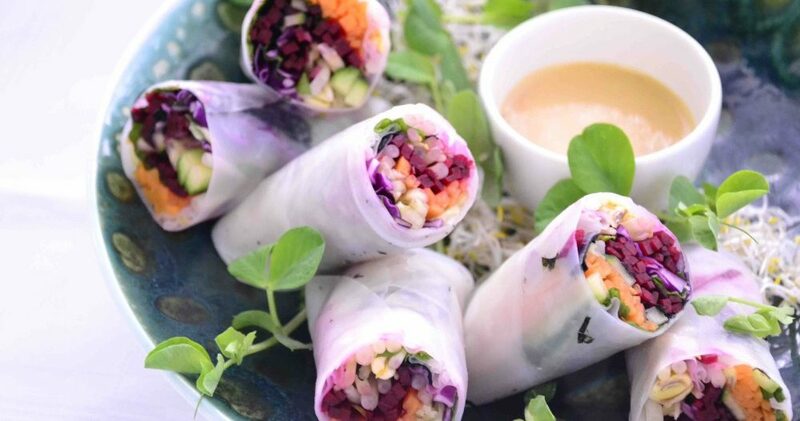 Serve in a dipping bowl alongside your raw rainbow spring rolls. *If you are having difficulty with the skin breaking, use two wrappers put together.